The Diva's Weekly Challenge #62 - "Use Spiral together with Paradox" - This is my first time doing the Diva's challenge. I found out about Zentangle a week ago last Saturday, spent an amazing week reading Zentangle.com and everyones wonderful blogs, and just set up a blog today :) Will post my rapidly growing collection of Zentangles and ZIAs shortly. Your work is beautiful! Zentangle is such a wonderful way to relax :) Glad you found it! This looks like a rose. It is so delicate and beautiful. you're a quick learner and fantastic tangler....awesome work, keep it up. Very well done for your first time. I tangle from december 2011 i gues! Have lot off tanglejoy! Our stories are almost identical. 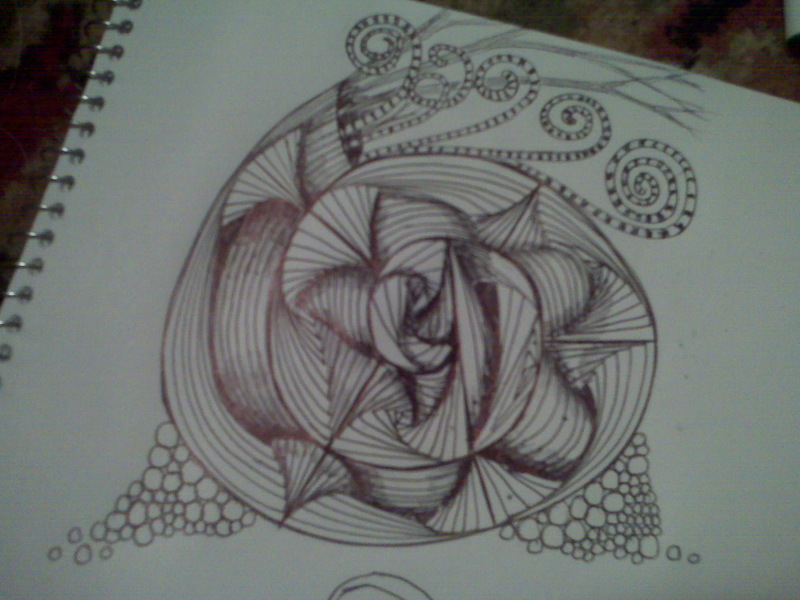 I just discovered tangling, too. Nice work. Looks like a magical sea creature. Welcome! This is a beautiful job of paradox and it spirals beautifully! I am sure we will see some beautiful zentangles from you in the future! This is really lovely! I thought this was a very hard challenge, and you rose to it beautifully. Wow! Beautiful. That's similiar to what was "in my head" when I drew mine, but mine just doesn't have the flair like yours does. Very beautiful! Love the color and the spirals that sprout out the top; and the bubbles (or pearls). You have made a beautiful design. Congrats on your new blog and on your ability to jump right in and tangle! This is beautiful. It looks like a shell being supported by grains of sand, And then sea plants coming out the top. Congratulations on your great 1st challenge and welcome. you have a super style Sarah! OMG - this is a beginning for you? Can't wait to see what else you can accomplish since this is gorgeous - love the loose, organic edges and the paradox looks FAB! WOW, this is realy fantastic for a beginner, you have got lot of talent .